Leave me a comment below. Let me know what you think of this episode. Let me know what you think about TV survival shows, which ones you enjoy or find valuable and which ones you don’t. I read every comment and reply to as many as I can. Hi Paul, great episode. I’m very glad that you have the same opinion on bow drill and friction fire as I do in that it is a viable survival skill and that people who say otherwise are most likely lacking in the right skills and knowledge. I left an instructor training programme with a chap who claimed to be one the leading survival experts in the uk and beyond as he totally dismissed friction fire lighting saying it wasn’t a viable survival skills, only a few people could actually do it, you lost more calories then you gained making a set and getting it to work and in the case of the hand drill the materials didn’t exist in the UK to make one work! Hi Craig, thanks for your comments. I’m sorry to hear you had the poor experience you relate with regards to an instructor training scheme. It’s a shame these closeted attitudes persist. But it’s great that you were not deterred and had the will to prove him and other naysayers wrong. Great to hear you are on the same page. Great episode again Paul. We have a lot in common. Bushcraft, maths and martial arts! 🙂 I did muay thai for several years and then became an instructor in wing chun. I am planning to learn Jujitsu and tai chi. It seems many people who are interested in bushcraft and/or survival skills are also interested in martial arts. My theory is the correlation has something to do with the desire of the individual to take personal responsibility for their own wellbeing. I agree with every thing you said Paul. 1) I know they are supposed to be entertaining not educational and so I always watch with a great deal of scepticism. If I see something that seems interesting I will make a mental note of it and research it later. 2) Regarding the unnecessary antagonism – I think that is what Dual Survival is all about. I can recall Joe Teti and Cody arguing about some really trivial issues at times. On one show Joe wanted to drink his own urine (or just wet his parched mouth with it) to give himself a ‘psychological advantage’ but Cody told him not to. I don’t think it was a geniune dispute. Joe was just doing that for the cameras. Another time Joe wanted to sharpen a few sticks to use for self defence because there were a lot of wild boar around and Cody wouldn’t listen. Again it was just drama for the show. I don’t think Cody would really have objected to having a couple of sharp spears..I mean how long does it take to sharpen a few sticks especially if you already have a machete? 3) Time compression is a problem as you said Paul. Sometimes the guys make fire, shelter and manage to set traps and catch something all in about 20 minutes! 4) I’m having to learn bushcraft and survival skills on my own because I can’t afford to go on courses yet. If I had the opportunity to train under a good instructor (like Mr Kirtley) I would have no need to watch any shows. So I try to augment useful information from shows with what I already know. For example we just covered the Eastern White Cedar in module 2 of the tree/plant course with Paul and since it’s not a tree I’m used to seeing here in England it’s features are not as easy to recall as other more familiar trees. But in one episode of Survivorman I watched a couple of days ago Les used what seemed to be the bark of the eastern white cedar to make fire. He didn’t mention the name but it didnt matter. I knew the tree is found in Ontario (where the show was filmed), bark colour and texture sure looked right..and obviously eastern white cedar makes good tinder. I also saw what I think was a black spruce in the same show. So a lot of these things help to consolidate and reinforce my existing skills and knowledge. There are other examples I could give..I usually pause the video and try to identify things…sotol, prickly pear cactus etc.. I also learned about the atlatl and a few interesting variations of the bow drill from Matt Graham as well as some interesting shelter ideas that I will try out. I only consider something learned once I’ve tried it out and tested it to see how feasible it is. So that’s how I try to educate myself from watching survival shows. It’s not the same as quality training but survival is all about using one’s initiative and that’s what I’m trying to do. I’m just biding my time until I find an opportunity to train under the guidance of someone like Paul. I forgot to add that although I do really admire Ray he seems to be focusing more and more on wildlife nowadays. I think people don’t give him the credit he deserves though. They usually dismiss him as a camper but I think he has so much more to offer. It’s just a shame that he’s not really involved in the survival genre very much..No yonder people like Bear have found a niche for themselves. Fantastic episode, the question on bow drill asked (and you answered) so much more than the bow drill issue – loved it. I did a recent course and managed to get an ember and fire from bow drill, with much help and encouragement, and it was difficult. I am sure that if i needed it I would really struggle and most probably fail, and I had no intention of practicing it as I did not see it as a skill I am ever likely to need. I still do not feel it is a skill that I will ever need but now I intend to practice it a lot because of the greater benefits of being able to achieve fire in this way brings – thanks. As an aside, the course was brilliant, I can highly recommend spending time learning with the Frontier Bushcraft team, it is like this blog on steroids and more. It’s good to hear from you and thanks for your kind words on the recent Elementary course. It was a lot of fun and it was a pleasure to teach you and coach you with bow drill in particular. As you know from other parts of your life, practice, patience and persistence pay off in developing real skill. These processes often provide self development in additional dimensions other than the physical skill on which you are concentrating. 1. I love your snapchats, Instagram, AskPaulKirtleys and other teachings . 2. Ray Mears is the only person I have the utmost respect for on TV for many reasons, mainly his attention to detail, the respect he gives to tribes and people he is working with and his precision and perfection to everything he does. It irritates me watching Bear Grylls and other rubbish that’s on and is obviously fake so I simply don’t, Ray in my opinion is in a completely different league to any other. 3. With bow drill technique, there is only so much I can see regarding my own posture and position. Now for me it’s not about just generating an ember, but about doing so quickly and efficiently as well as in an elegant and aesthetic manner, as you said, if something looks good and is done with correct form, it normally is (please do not take this as what I do is perfect, far from it!). I have a number of times asked my partner to video me from different angles, watched them, gone back and studied those who truly are masters at the skill and adjusted, it worked for me. Just like in my own profession, I will often use mirrors to ensure my technique is correct. Keep the great work up Paul, I love learning from you and I have done so a lot. Thanks Tom. Great to see and read about you putting in so much effort into your own personal skill set. 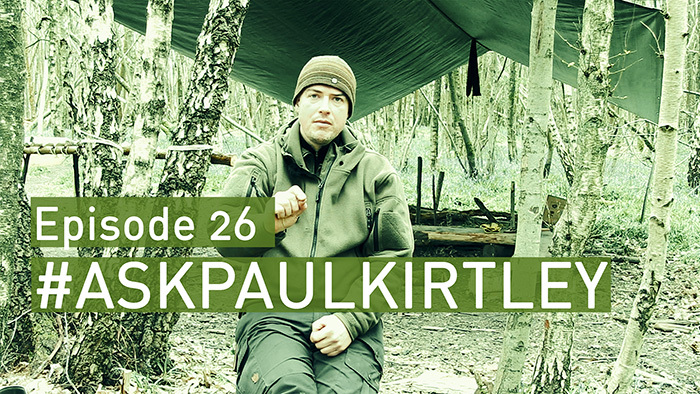 Very interesting episode of AskPaulKirtley and glad you spent a good time talking about the bow drill. I have had people in the bushcraft community say that the bow drill is just a show pony and has no real world applications, due to the fact they see it as an unreliable way of starting a fire. In my eyes its all down to mordern day man or woman being lazy and are used to the flick of a light switch attidute. I would guess the majority of people who see the bow drill as an ineffictive fire strarting meathod have only attempted a fire by friction a hand full of times and having done it few times and 75% of the time fail to achieve an ember decided its not worthy of more time and effort which is a shame for them. Personally I know I have not put enough time into this skill and pushed myself enough, I know I can go out and harvest the woods to make a set from the woods but I can not be sure I will always get an ember, but I know each time I attempt to a fresh set I am improving my skill and knowledge. I have a small amount of back ground knowledge of the 10,000bc show and while there was a lot that learnt behind the scenes in a experimental archaeology it was the drama that took up the air time. I think the other issue with UK-based people making pronouncements about the efficacy of bow-drill is that many of them have not travelled very widely, if at all. As far as I’m concerned, this lack of context renders their view point null and void. Hi Paul, very interesting episode of AskPaulKirtley as you focused on bow drill questions that I like. I really think that bow drill is a survival still “actual” way to light a fire in a real survival situation and I started to learn this skill just because I love the “fire part” of the bushcraft; but I soon discovered that bow drill pushed me to learn other parts of the bushcraft like plant knowledge. Also bow drill force me to pay more attention to every detail. Concerning survival shows, in my opinion, most of that are fiction and there is nothing about survival: Bear Grylls show just per say, looks loke mountaineering and climbing show instead survival show; sometimes military escape 🙂 🙂 . No problem with that as in the past I did climbing but it is a different thing! What I really like is Ray Mears programs as for me there are lot of bushcraft and informations. Anyway, if survival shows can do discover the nature to people they are welcome and one can always get the right imput and hone the skills step by step. Thanks a lot as I’m really learning from you and have a nice week. Nice to hear that you are also appreciating the value of learning bow drill for multiple benefits in many areas of bushcraft. Regarding the bow drill and other skills, its simple and boils down to this………..if you dont have any other quicker calorie efficient way to get a fire going its viable! If you lose all other methods of making fire: like lighters, matches, fire flash etc its viable! Its a skill which once perfected will remain in your body and mind til the day you die. Lighters, matches etc etc can always be broken or lost or run out of fuel or spark. They can also be stolen! Sadly the bruised ego of those who cant do it will trash the idea and put themselves and others off learning it. Skill/knowledge creates self awareness, self respect and confidence which helps when chucked in the deep end. You cant buy that!!!!!! Having your bases covered removes stress, shock and panic……..all of which can kill yer. The load is light when yer skills are tight and to me bow drill is a core technique/skill! A 100% must have and anyone who says otherwise is talking out their arse! It is important to have skills/knowledge in fire craft, shelter building, hunting/trapping/fishing/gathering, water collection/purification and all without man made gear/kit. Any skill which you can learn and use at any time is called security. Relying purely on kit with no Plan B…… is called stupidity. Its important to Think for your self…………..some people cant. Always keep yer mind and body ticking over. Think outside the box, improvise and adapt, keep moving forward and have a strong bomb proof set of core skills that you can use/rely on anywhere. Anything else is just fluff! Simple advice: LEARN the bow drill and hand drill techniques! Its better to have it and not need it than to need it and not have it! Thanks for another great episode, I really enjoyed this one. I think it’s worth remembering that friction fire-making techniques were not ‘survival skills’ to early peoples, in the modern sense. In fact, they were the only methods available, and were learnt on the back of generations of hard-won knowledge of materials and techniques. They were an everyday, but essential, skill. In almost every case I have heard of, however, hunter-gatherer peoples have switched to a ‘better’ method when given the chance. Having said that, I was (once again) really happy to hear your clear and sensible explanation of why it is worth learning the technique – I fully agree! It’s a great skill to learn and a great technique for making people really think about each step in the process of successful fire making (not that I have ever managed it – I prefer flint and steel myself!). Thanks for the link. I agree the survival skill distinction may be a modern one but there was still a difference between keeping a fire going in a large camp and needing to light a fire while out on the trail or hunting. Much of life in the past was about survival rather than leisure and this should be remembered too. Hunter gatherers still exist amongst native peoples of the world and in my experience, many still hold onto their bush skills, including using fire by friction on a day-to-day basis. Anyway, the original question was can these skills still be relied upon on a day-to-day basis. History would suggest they can, as long as you have enough skill. But as John Post rightly states elsewhere in this thread, most people won’t ever put in enough work to be proficient enough. I try to watch your shows when I get chance and have enjoyed this episode. Some great questions and very thorough answers from yourself. The answer on friction fire lighting was excellent, and I do feel for Craig Fordham being told all that nonsense about expenditure of energy etc. It sounds like the same sort of survival instructor who might say fungi are pointless as they contain few calories. The problem is, that they sound incapable at both skills and therefore not very good at what they do, i.e. haven’t put the time in. Bow drill, as you well know is quite easy on a good day and a fire from your surroundings on a bad day is a very worthwhile thing. I will admit, that being in a large group with each person owning several lighters in their kit, is a nice thing, but knowing you don’t always need them is even greater. Fungi make rubbish food taste nice so it is worth knowing a few edible species,especially as they are quite filling. Once I had nothing else to eat for ages in a camp but a warm large brown birch bolete that had been sat by a fire for 24 hours. It was like having a steak. Gorgeous and excellent for moral. I watch the odd survival show, all of which have been produced since I did my bushcraft training, so I watch them just to see how things are changing in the bushcraft media which has a powerful effect on people I meet, rather than to learn. Cody seems a good chap, and I’m glad he has spoken about his experiences of the show, but I think on many occasions he also fell foul of the camera and producers. Often sat down moaning about being tired or the state of his feet while others did the gathering and energy rich work. “10,000 BC” was quite good once you got over some of the pretentious 20 year olds, and I know they are put in there for show, so I gloss over their tantrums. “Alone” was very good and hats of to those guys who lasted a very substantial amount of time. Ironically, it was a very different and energetic young man who emerged as one of the strongest characters of the show, and I think he helped to make it a success, as much as the more skilled guys who obviously knew their skills. Well done to all for sticking it out under scrutiny. Rays shows were inspiring and excellently made. I agree with you about Alone. It was a great show! the final 3 guys were strong willed. Good to hear from you – it’s been a while. Thanks for your extensive comments. You make some very good points and I agree with you with regards to fungi too. As for the survival shows, I think I possibly need to revisit the later episodes of Alone as I have not seen them. I’ll check them out. Keep up your good work too. Enjoying the carving photos on Facebook in particular. waste of time. The natural world provides a true “university” for all outdoors people. Agreed Jim, nature provides the real learning. Hi Paul, great presentation as always. I enjoyed your talk on the bow drill, it is a method that I practice and have had success with. I know I don’t practice it nearly enough, and I need to try many more species of wood. I in no way would consider my self proficient with it, though I have started many fires using this method. Having said that, I would never want to rely on this method in an actual life or death survival situation. I teach hunter safety here in Ontario which has a wilderness survival section in the course, I tell all of my students to carry at least 3 different methods of lighting fire and carry prepared tinder. The reality is that the majority of people are not going to put the time in that is required to learn and become proficient with friction fire. Most lost victims are too panicked and upset to put together the proper materials and then make a bow-drill set, and then actually make an ember and then turn that ember into flame. This is also true of primitive shelter, most people don’t even realize they are lost until the end of the day and they have about an hour of light left. I teach preparedness; carry your shelter, carry your fire, container, knife etc. When the suns going down and you have an hour before darkness, you need an expedient shelter, and a fast and sure fire starting method so you have enough time to gather as much firewood as possible for the long cold night ahead. I would never tell someone that primitive living skills are a waste of time and that they shouldn’t learn them, what I am saying is that your average person is not going to put the required time in to own them. Hi John, I completely agree with every point made here and teach the same, including about shelter. Good to know you are on the same page. Probably native people across Canada and Alaska have more chanche than us to get a coal with a bow drill as for them it was like our matches, if not cigarette lighter; probably, as they used bow drill as a regular basis they had the possibility to harvest the right wood at the right time and let it dry by the fire already set…. (before the previous set consumed) instead we have not this possibility in a real survival situation, so we have to do all perfect in one time! Don’t get me wrong, I can only imagine what mean living off the land 10,000 years ago but for some reason natives maybe was easier in light a fire in that way but, bow drill fire still is the usefull and easier way to get a coal if something go wrong and for some reason our matches go wet; naturally nothing happen by chance so it means use some calories to make fire this way but it is. There are TV shows where people in a survival situation??? I saw one on YouTube called “Alone”, learned not to lose my fero rod! and take a walk upstream to see if there are dead carcasses in the river I am getting my water from! And IF some jerk producer leaves me on an island with more bears and cougars than humans, WITHOUT an high-powered rifle/pistol, I will certainly entertain the thought of getting one and using it on him!!! OH! and I didn’t learn anything worthwhile from the show… Shame, but true! Have a good one! 🙂 Kev B.